You are here: Home / Reviews / OptinMonster – Why It’s The Best Lead Generation Tool Ever? 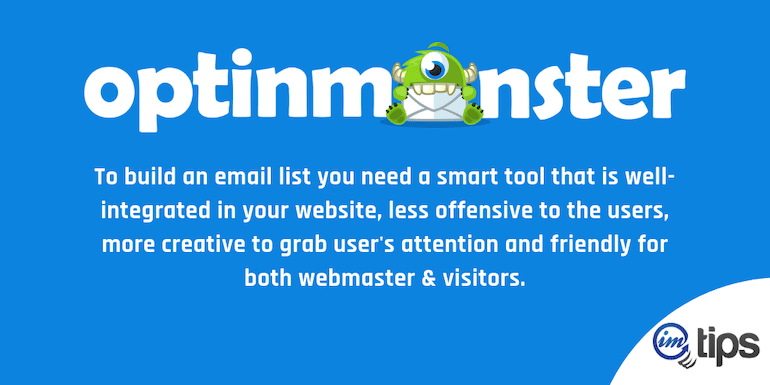 Optinmonster – A smart lead generation tool that is well-integrated in your website, less offensive to users, more creative to grab user’s attention. Email marketing is still the most cost-effective method to reach out to potential customers and clients. But for that, one needs a list of email addresses of your clients those who are actually interested in your products or services. Unsolicited email to people is destructive not only for the business but also for the overall brand reputation. Email list building has to be done with permission from the user keeping in mind, they have a right to personal space. Disclosure: Some links are affiliate links to OptinMonster where I get paid a commission if you sign up using it at no extra cost to you but has also provided a direct link just in case you don’t want to use the affiliated url. OptinMonster (Non-Affiliate Link) can come to the rescue to help generate forms that visitors can’t resist to and subscribe. I will share what makes OptinMonster the best lead generation tool. Days are gone when adding a simple signup form in the footer used to do a lot. Nowadays it will be almost be ignored. If you are a blogger, OptinMonster can help you build an email list really fast from visitors that end up on your blog. No one can guarantee you that visitors who have already visited your blog will revisit it on their own in future. This is where OptinMonster comes to your rescue. With customized campaigns and Optin forms you can generate a healthy email list and reconnect with your visitors to encourage them to visit your blogs on daily basis. Create visually engaging subscription forms that attract visitors to fill in their details and submit. It has Behaviour Detection Technology which enables you to show the exact form to the exact visitor at the exact time that will help you to convert the visitor into a subscriber. The technology can intelligently display the opt-in form on pages with the right message that can help convert the visitor to a subscriber. OptinMonster also allows you to create pop-ups when the visitor is about to leave your blog. There is so much more than form-based user subscription with Optinmonster. As and when your visitors read more of your content, they are more likely to subscribe. The biggest problem for any blogger is to get the right content in front of its visitors. Bloggers often have thousands of great posts buried deep under. Let’s assume a particular topic on your website gets more visits. You can even create a campaign in OptinMonster only for visitors visiting a page or a blog category. Now, what you can do is display a custom message on that particular page for those visitors only and instead of subscribing them, you can even redirect them to a similar topic or even a product that is closely related to the topic. This way you can convert your visitors into paying customers. With OptinMonster you can run targeted campaigns based on the user behaviors, insights of blog pages, visitor’s geo-location, gender, the device they use to view your blog, and so on. OptinMonster is a cloud-based SaaS tool but it has an easy integration WordPress plugin where the complete OptinMonster dashboard can be inside your WordPress admin area. So to create campaigns or access to reports can be done inside the WordPress admin. As I told you earlier, there is so much more than just form-based user subscription with Optinmonster. You can let the visitors subscribe to your YouTube Channel, ask them to join your WhatsApp group, promote a Facebook page, Pinterest board or Twitter – The options are limitless. 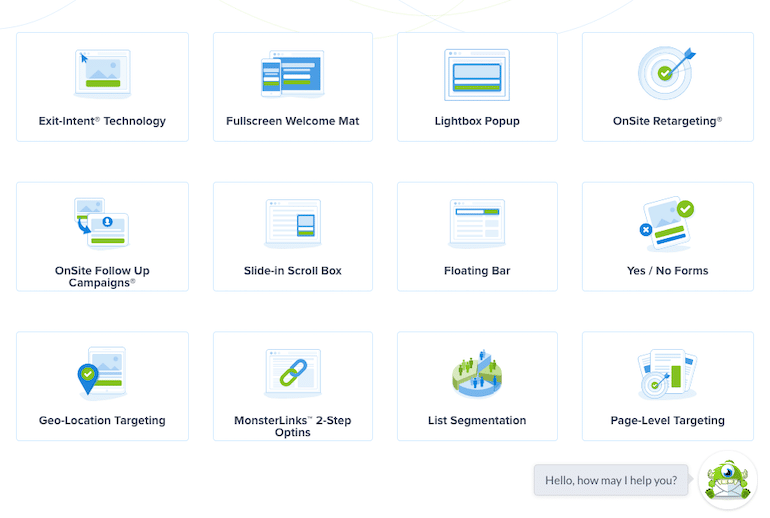 OptinMonster provides you with an integrated A/B testing tool so that you can test two or more different variants of opt-in forms against each other on the same page or a totally different set of pages. With the help of such tests, you will be able to figure out what kind of opt-in forms works on which type of pages/category of posts and maximize conversions or sales. Taking A/B testing to the next level, one can test various sets of opt-in forms integrating them with Dynamic Text Replacement and campaign triggers too. If you are operating multiple blogs just like me then OptinMonster will make it a lot easy for you to manage them from the one single account. You can manage all your blogs, edit & execute opt-in campaigns single-handedly using Optinmonster’s dashboard. Not only for a blog but OptinMonster has everything an eCommerce webmaster needs too. Cart abandonment is the biggest problem for online sellers immaterial you sell on premium online platforms or through your e-commerce websites. Let’s understand what OptinMonster can do to reduce your cart abandonment problems. OptinMonster has exit-intent technology which detects user’s mouse behaviors and shows them a targeted message when they are about to leave. For example, you are selling mobile phones on your website. A visitor after scrolling a notable amount of pages on your site stops on – Let’s say ABC mobile phone product page. Here also after spending a considerate amount of time hustling with price, delivery, technical features and finally adding it to the cart leaves the purchase in the middle of nowhere and vanishes in thin air. You lost a potential sale! With Optinmonster’s exit-intent technology you can design a campaign for these kinds of buyers who will get a unique pop-up when they are about to leave the page. An enticing exit offer may get hold of a runway buyer’s attention and may encourage a last minute purchase too. When you have an email list of ready-to-buy customers, you can always use it to grow your sales. Shoot your subscribers with new products, festival offers, free giveaways and a lot more in your email. Remind them about an ongoing great deal or savings offer on your website. This can really help you increase your daily sales count. If you show the same campaign to an online buyer (who has already subscribed you) repeatedly then this is going to be the biggest turn-off for them. Instead, altering the campaign content can keep the interest of a buyer intact when he/she visits you again. This is possible with Optinmonster. Optinmonster’s Onsite Retargeting is for repeat buyers. You can design a separate campaign (new promotions & offers) to target repeat users based on their previous purchase history/pages visits or any other kind of interactions. It helps e-commerce sellers with onsite behavioral data to design custom marketing campaigns to boost sales & revenue. This feature is helpful in reducing cart abandonment. When a buyer comes back to your website you can show them a personalized message with their name in a pop-up using the Dynamic Text Replacement feature that includes the product name too which they saw previously. Dynamic Text Replacement also allows you to use the information of a buyer that you already have from your email marketing or lead management software to show targeted cross-sells and upsells item which is selling good upfront. Hence, a combination of Dynamic Text Replacement, Exit-intent Technology, User Behaviours, and custom campaigns can dramatically reduce cart abandonment and convert visitors into buyers. Yes / No form is the most popular multi-step opt-in form because of its ability to provide visitors with two options which significantly increases conversions. Actually, users are worried to give their visitors options fearing that it will lower their conversion ratios. But the later one is wrong. The yes/no forms work on behavioral psychology. Visitors are more likely to connect when they are given a choice. This makes them feel that their own choice will make a difference. In this way, the yes/no forms guide the visitor to take the next important step in the process. Moreover, the yes/ no form can be combined with advanced Page Level Targeting, OnSite Follow Up Campaigns, OnSite Retargeting, Geo-Location Targeting and more. The above-mentioned forms can be customized with OptinMonster drag and drop builder. You can edit the color, fonts, image, and texts of the forms to match the layout or color theme of your website or blog. Additionally, one can also add elements like dividers, buttons, videos, countdown timers, and more to any campaign to make it more creative and interactive to the user. Since all the OptinMonster templates are mobile responsive you don’t need to customize it anymore for mobile screens and devices. They are 100% mobile friendly and loads on any screen size without any problem. As discussed earlier the exit-intent technology of OptinMonster is one of a kind that is used to detect when the visitor is about to leave your website or a particular page. You can set up an exit intent pop-up to make user stay longer on the page, take another action, give an offer, supply a discount (reduce cart abandonment) and so on. OptinMonster comes with real-time practical functions that help you convince and convert your visitors. Let’s see what these features are. Scroll Triggers – This is a really fascinating function. When a user scrolls down to the end of a page show them a pop-up. This could be a discount offer if you are selling products to push sales or it could be an email subscription request with a free e-book download. Page Level Targeting – This function allows you to create targeted opt-ins for selected pages. This is helpful on cart pages. You can strategically put a discount pop-up when the buyer tries to close the cart page leaving the purchase process in middle. Easy A/B Testing – You can always do the A/B testing on 2 different pages or on a single page with 2 different messages. This will give you an idea of which one is performing the best. Time Display Controls – Pop-ups can be annoying if not shown on right time. If you start hammering visitors with promotions before he/ she engages with the page content then they are likely to run away. The time display control shows content at just the right time to the visitor during their visit without annoying them. MonsterLinks 2-Step Opt-ins – This is the most effective signature type campaign of Optinmonster. MonsterLinks turns any image or link into a 2-step opt-in campaign when a visitor clicks on the same. In short, when visitors on a page will click on the image or link, a popup will unfold asking them either to subscribe or buy. Inactivity sensor – Typically like exit-intent technology, the inactivity sensor works on user behaviors. When a user stops all the activity on your website/blog it usually means he/she is about to leave or say abandon your cart. Inactivity sensor tracks this lack of action and triggers a form or pop-up to reactivate the user. Campaign Scheduling – Campaign scheduling is an advanced targeting technology to run time-sensitive campaigns on right time and more effectively. This function detects the user’s time zone so that you can show holiday or festival promotions during a stipulated time frame. You don’t need to worry about when the promotion will end and which one will start. Everything can be scheduled and taken care of with it. 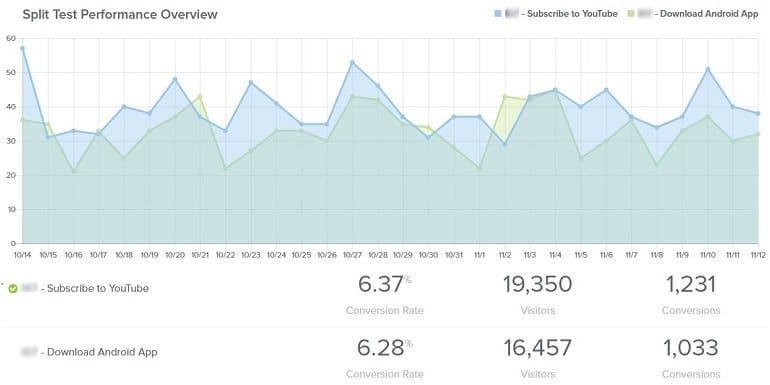 By integrating your opt-in campaigns with Google Analytics, OptinMonster gives you reliable data that will help you track and measure the success of your ongoing campaigns. 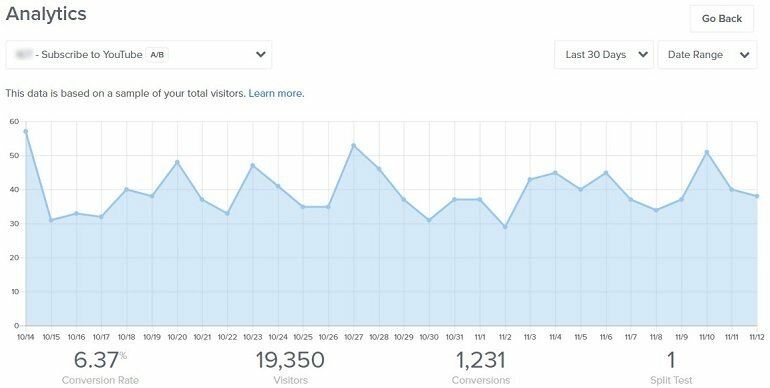 With conversion analytics you can monitor the highest & lowest converting pages, the number of visitors, total leads generated out of them, campaigns for mobile devices and specific browsers. If you are using the A/B testing feature then you can get the split test data to analyze which one is leading. Refer to the image below. The above image is an example of a LIVE campaign of a Split Test between Youtube Channel Subscription v/s Android App Download. You can make out from the above image that Youtube Channel Subscription has generated more leads compared to the later one. It may so happen that you are selling Product A in Location X at a comparatively low price and moreover you are offering a 20% discount if they visit your nearby store in order to increase the footfall. Everything’s just superb unless someone in Location Y anonymously finds out about your offer (running for Location X) which is totally irrelevant to him or her. This happens many times when visitors find certain offers online that are not related to them. The point is how would you pitch an offer on your website for specific locations while baring users from seeing it who are in totally different locations. Geo-location targeting does this for you. It shows campaigns to relevant users based on their location. This is more helpful if you are an e-commerce seller. Shoppers mostly use smartphones, using Optinmonster’s Geo-location feature an eCommerce seller can easily pop-up a coupon or make an offer to the buyer that can be redeemed at a nearest physical store. This means there are better chances for a seller to grab more sales with Geo-Location targeting. OptinMonster is compatible and it seamlessly integrates with all website whether it is WordPress, Drupal, Joomla, or a static HTML website. It also integrates with major eCommerce platforms including but not limited to Magento, Shopify, BigCommerce, WooCommerce, Volusion, and PrestaShop. For email marketing, it has integrations with all the major email marketing service providers. OptinMonster (Non-Affiliate Link) has all the necessary features that a lead generation tool must have. Whether you are an eCommerce seller, a publisher or an online marketing agency, OptinMonster can be of great help in growing your email list, reducing cart abandonment and increasing sales conversions.